Ettamogah Pub on Travelsnapz - Travel the world for just a few clicks! 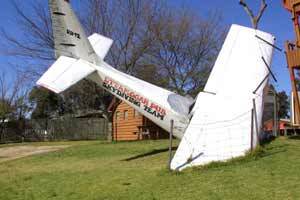 The Ettamogah Pub near Albury, a country town in Australia. What was once an imaginary hotel in a cartoon by Ken Maynard, has now come to life. Watch out for the barbwire on the backside, get your mits around a schooner, Mate - and enjoy the hospitality of the Ettamogah Pub. It's just a great place to take your sheila, Mate - 'specially on Saturday arvo when the blokes will be hanging out in the back bar and you can have a yarn about the footy. 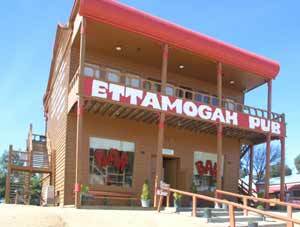 The Ettamogah Pub was inspired by cartoonist Ken Maynard who turned it into Australia's most famous comic strip hotel. With leaning walls, a tree that grows through two floors, a dog kennel out the front, and an old truck on the roof (must have been a flood, Mate), the hotel was built about 15 kilometers North of Albury in country New South Wales. Maynard once lived in Albury, so the site is quite appropriate. The word Ettamogah is Aboriginal for 'place of good drink'. Maybe the best time to go there is on Saturday or Sunday when the locals come out for a bush dance and a sip of Fosters. A schooner is a glass of beer. don't take any flying lessons. at least we missed the dunny!